Keeney & McArthur puzzle – might be solved? | "Ever Widening Circle"
Keeney & McArthur puzzle – might be solved? PG 500: O. J. Riley, a prominent grocer of Harvard, Neb., and a substantial and influential citizen of that place, was born in Bradford County, Pa., April 29, 1844, being a son of Joseph and Jane (Dodge) Riley, the former a native of New England, and the latter of Bradford County, Pa. Joseph Riley was a son of Maj. Riley, of Connecticut, and Mrs. Riley v/as a daughter of Loren Dodge. To Mr. and Mrs. Riley a family of six children were born, of whom James O. was the second, five of the family being now alive. The father, who was a carpenter by trade, died in October, 1883, his wife dying in the month of January, 1887. When the subject of this sketch was eight years old his parents removed to Corning, Steuben County, N. Y., where his youth was spent. He learned the carpenter’s trade under his father, and followed this calling for a number of years. At the age of seventeen he went to Tioga, Pa., from which place, about one year later, or in August, 1861, he enlisted in Company H, Forty fifth Pennsylvania Volunteers, remaining with this company until the close of the war, participating in the battles of Hilton Head, Fredericksburg, South Mountain and Antietam, the siege and capture of Vicksburg, Petersburg and Jackson, in all of which he discharged his duties in a very creditable manner. From the war he returned to Tioga, Pa., but shortly after removed to Hornellsville, N. Y. , where he resided two years, employed in the repair shops of the New York & Erie Railroad. In 1868 he removed to Alton, Iowa, but after conducting a meat market there for one year he returned to York State and learned the painter’s trade while a resident of Wellsville. In 1872 he again came West, and this time settled in the State of Nebraska, residing one year in Lincoln, a short time in Harvard, and then took up a homestead claim fourteen miles northwest of Harvard, in Hamilton County, where he resided seven years, giving his attention to farming. Upon returning to Harvard, in 1881, he engaged in the grocery business, which occupation has since received his attention. His establishment is one of the leading groceries of the place, and he commands a large share of public favor. 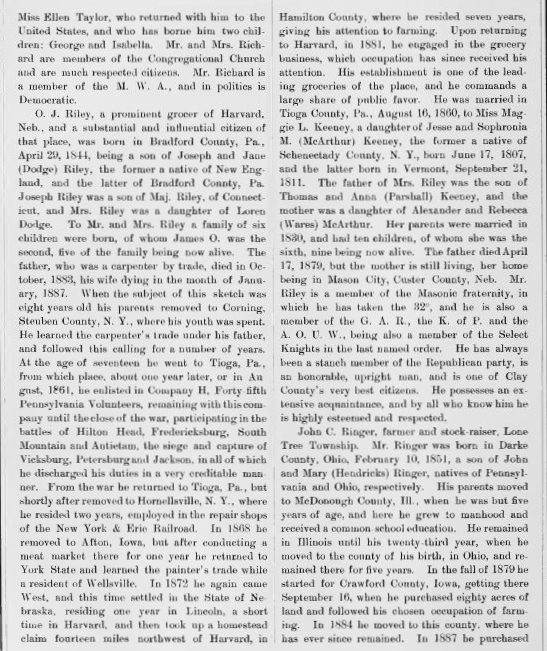 He was married in Tioga County, Pa., August 16, 1860, to Miss Maggie L. Keeney, a daughter of Jesse and Sophronia M. (McArthur) Keeney, the former a native of Schenectady County, N. Y., born June 17, 1807, and the latter born in Vermont, . 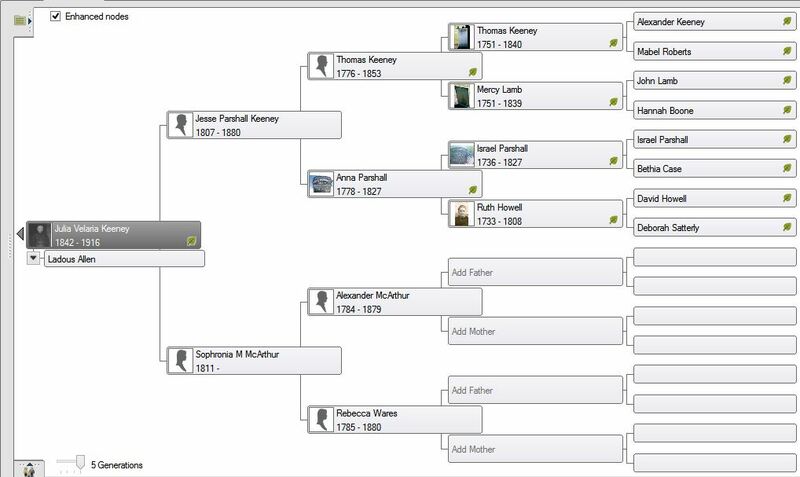 The father of Mrs. Riley was the son of Thomas and Anna (Parshall) Keeney, and the mother was a daughter of Alexander and Rebecca (Wares) McArthur. Her parents were married in 1830, and had ten children, of whom she was the sixth, nine being now alive. The father died April 17, 1879, but the mother is still living, her home being in Mason City, Custer County, Neb. Mr. Riley is a member of the Masonic fraternity, in which he has taken the 32°, and he is also a member of the G. A. R. , the K. of P. and the A. O. U. W., being also a member of the Select Knights in the last named order. He has always been a stanch member of the Republican party, is an honorable, upright man, and is one of Clay County’s very best citizens. He possesses an extensive acquaintance, and by all who know him he is highly esteemed and respected.